Ashley Hedlund is a multi-faceted trumpet player, educator, drill designer, and advocate for female musicians. Ashley has performed in a wide range of ensembles, from chamber music to large bands and orchestras, performing professionally with the Sandia Brass Quintet and the New Mexico Philharmonic. Bio continued at the end of the post. In two weeks, I will be putting on my master’s recital, also known as “More Than Just Dead White Guys.” This performance will feature works by living women composers, with one work being the world premiere of a work I commissioned! In two weeks, I will be putting on my master’s recital, aka “More Than Just Dead White Guys.” This performance will feature works by living women composers, with one work being the world premiere of a work I commissioned! If you happen to be in the Albuquerque area, the recital will be held on the University of New Mexico campus in Keller Hall, on February 16, 2019 at 6:00pm Mountain Time. If you can’t attend but would still like to hear some of these works, a livestream will be available! You can head to https://www.youtube.com/watch?v=q0wnhFp0fPU to view the livestream! I learned about Larsen while enrolled in a Female Voices in Composition course last year. Larsen is one of the most performed and recorded female composers, especially within the voice department. She has written for almost every genre and instrument as well, and I came across her fanfare and brass quintet works. This fanfare, written for the opening of the Women’s Sports Pavilion at the University of Minnesota, packs a punch as an opener. This unaccompanied work was written to be performed in a large space, where the acoustic delay creates layering between phrases. In just two minutes, this fanfare gives very little rest to the performer, swiftly shifting between styles and pushing the performer’s dynamic and technical range. I emailed Dr. Bernofsky to introduce myself, my recital project, and to thank her for writing so many amazing brass works. I have a little personal goal to program one of Bernofsky’s works on every performance, as she has written for a variety of combinations of brass instruments. Bernofsky is a violinist, not a brass or trumpet player; however, she sure knows how to write well for the brass world! Her concerto is set up in the standard three movements for C trumpet and piano. In both the first and third movements, the main melodic material is catchy and easy to remember, which I believe is a great quality to appeal to audience members. I’ve even caught my accompanist singing the piano part to the first movement while walking down the hallway! The first and third movements are technically heavy, but after learning the entire work, it will feel so rewarding to put my spin on her concerto. This piece is written for the standard brass quintet and portrays the continual journey of Helios, the god of the sun in Greek Mythology. Helios is known to begin his day circling the earth in a golden chariot, ending the day on a golden boat which sends him back to where he will again begin the next day. This work depicts that journey, beginning with an energetic ostinato opening, which quickly become secondary to the passing sixteenth note passages between all five voices. This journey lasts until the evening, where a softer and more tranquil character is presented, ending Helios’ daily voyage. And here we have my first commission and my small contribution to the women in brass world. Whitney George is an amazing woman and incredible composer, with her work centering around the use of mixed media combining dance, art, and theatre. She was completely on board when I emailed her with my initial idea about commissioning a piece for my recital. This project had no restrictions, limitations, or requests and I was willing to try anything. She created Incantations, a series of meditative pieces for trumpet, piano, and optional electronics. These incantations remind me of those Choose-Your-Own-Adventure books that I read when I was growing up. The performer can pick and choose any or all of the incantations, decide on which repeats to take, and how immersive they want the whole performance to be. This takes me completely out of my comfort zone with performing and to be honest, I am incredibly nervous but SO EXCITED. In my performance of this work, I will be performing this completely in the dark, with roughly around one hundred electric candles that will be spread in and around the stage. There are ways to make the performance more interdisciplinary, so the possibilities are endless. Gotkovsky is most known—in the trumpet world, at least—for her two concertos. There is almost no information written on Concertino, a shorter work than the lengthier concertos. All three movements establish vastly different characters from the very beginning, which take the audience on a journey of styles. This work opens in a regal and articulate manner, making up for the seemingly simple technique. The second movement places the trumpet in the role of a singer, creating natural rhythmic passages that should be performed…well, not like a typical trumpet player would. Finally, the work closes with a fast-paced closer, demanding constant unintuitive intervals and long rhythmic passages. Between the three movements, clear styles must be performed to give the life to the music that this piece deserves. This has been such a fun project and I can’t wait to perform this program shortly! All the research has led me to make an even longer wish list on repertoire I look forward to working on. 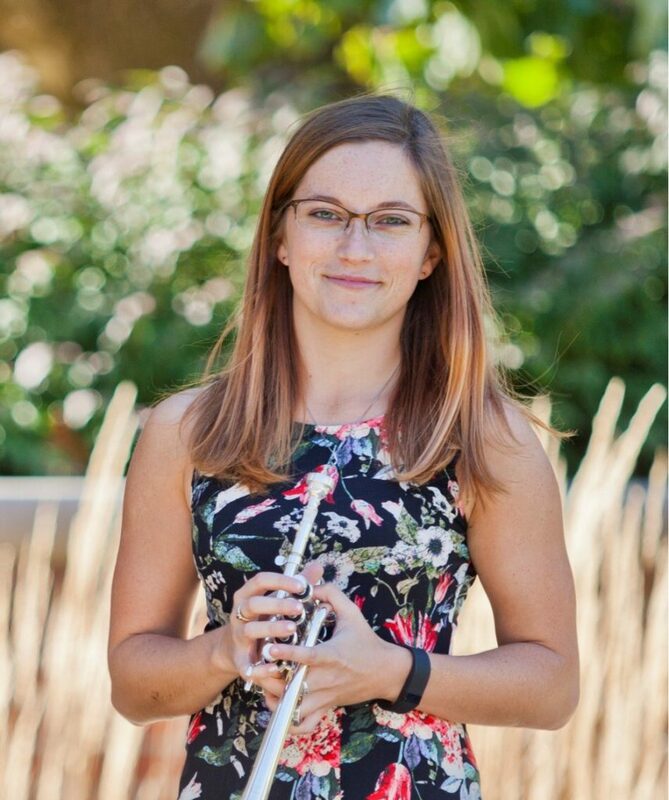 Ashley teaches lessons, sectionals, and full brass rehearsals in many of the local Albuquerque middle and high schools and has worked with students of all ages and skill levels. Ashley is passionate about expanding awareness and representation of female brass players and composers in music. She has begun her own research on the creation of new music. She also designs drill for numerous marching bands across the country. She has written for bands in Illinois, Michigan, New Mexico, and Virginia, writing for ensembles with 15 to 150 students. Ashley is originally from Grand Ledge, Michigan and is now living in Albuquerque, New Mexico pursuing a Master of Music in Trumpet Performance. She holds a bachelor’s degree in Music Education from the University of Illinois at Urbana-Champaign. Ashley Hedlund is a multi-faceted trumpet player, educator, drill designer, and advocate for female musicians. Ashley has performed in a wide range of ensembles, from chamber music to large bands and orchestras, performing professionally with the Sandia Brass Quinte and the New Mexico Philharmonic.